Cloud Peak is located in central Wyoming’s Bighorn Mountains, and is the centerpiece of its namesake Cloud Peak Wilderness area. Cloud Peak also happens to be the second most “topographically prominent” mountain in all of Wyoming, thanks to the isolated nature of the Bighorn Range. That means it stands up really tall compared to its surroundings. Cloud Peak is surrounded by some amazing alpine terrain, and is a popular destination for backpackers, hikers and climbers. Most will climb Cloud Peak as an overnight backpacking trip, but it is regularly done as a long day hike as well. After a fantastic climb up Crazy Peak in Montana, Cloud Peak was the next objective in our “Michael’s Awesome Peaks” road trip. Michael, John, and I got a cheap motel in Worland Wyoming the night before, then a leisurely breakfast, before driving up to the West Tensleep Trailhead. We got the last parking spot in the large trailhead parking lot, and then hit the trail at around noon. I really didn’t know what to expect from the hike, but was pleasantly surprised with the beautiful terrain. The early part of the trail covered quite a bit of ground, but wasn’t steep. It gained only 900’ over 5+ miles to Lake Helen. After a nice lunch stop at Lake Helen, we continued on to Mistymoon Lake. Both lakes were highly scenic. We’d read that many folks make basecamp at Mistymoon, but there were only a couple of tents there. But we continued onward to Paint Rock Creek, where we could see several tents down in the valley (I later counted 15 tents including ours). So much for solitude, but it was certainly very pretty. We set up camp up on a shelf above the Paint Rock Creek waterfall, with most of the other tents down low. It was a great campsite, and we enjoyed dinner before heading for the tents for the night. Then next morning dawned clear, and we were hiking before 7am. This peak sees a lot of traffic, so the use trail down low was easy to follow with lots of cairns. Higher up, we had many route choices, with cairns all over the place. We mainly followed our noses, staying in the middle or right side of the gully for the most part. Plenty of boulder hopping led us to “the narrows” (easy to navigate), and then the final massive boulder filed to the flattish summit of Cloud Peak. We enjoyed a lengthy stay on the summit, having a snack and soaking in the views of the surrounding mountains. To the northeast, Glacier Lake and the Cloud Peak Glacier were particularly impressive. We each belly-crawled to the edge of the cliff to maximize the viewing effect. Our descent back to camp was faster than the climb up, but still time consuming with all the boulders and talus. By the time we packed up and pumped water, it was starting to heat up. We weren’t looking forward to climbing back up and over to Mistymoon, but it wasn’t that bad. Now all that was left was the looonnnggg hike back to the trailhead. After a long day, we were plenty pooped by the time we got back. I was thoroughly impressed with the Cloud Peak Wilderness, it’s a beautiful alpine area. Our round trip for Cloud Peak covered 24 miles and 6000’ feet of elevation gain. Next up for us was some well-earned dinner, a drive to Meeteetse, and climbing Francs Peak the next day. 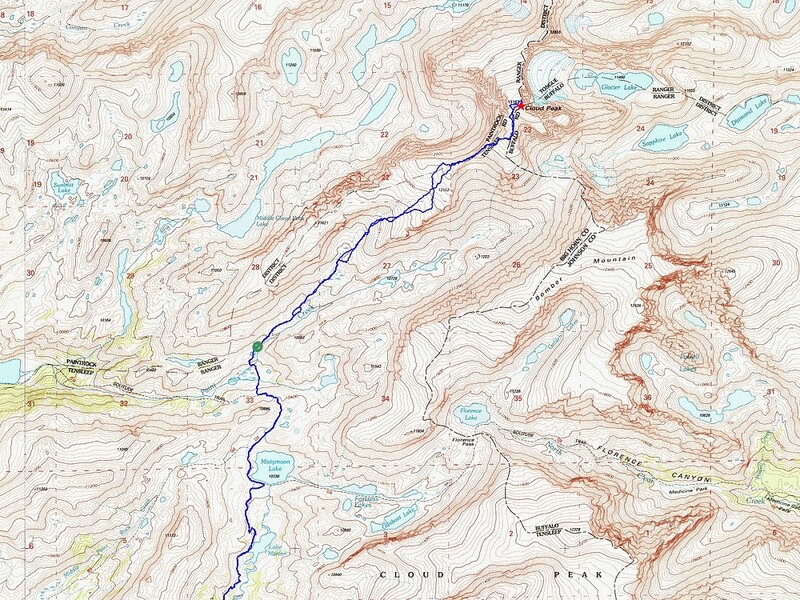 Map of the northern part of the route, 24 miles and 6000' gain round trip. Several nice meadows near the trail. Cloud Peak from Mistymoon Lake. Dropping down to Paint Rock Creek. Small waterfall on Paint Rock Creek. One of several pika near our campsite. Sun setting on cloud peak above our camp. Stars starting to come out. Hitting the trial in the morning. Heading up through the talus. Summit of Cloud Peak coming in to view. Glacier Lake and the Cloud Peak Glacier from the summit. Peering over the cliff at the lake below. Climbing back up from Painted Rock Creek. Cloud Peak from Mistymoon Lake, during the hike out. Tired but enjoying the scenery on the way back. Almost back to the trailhead. Map of the northern part of the route, 24 miles and 6000' gain round trip.West Tensleep Trailhead.West Tensleep Lake.Several nice meadows near the trail.Lake Helen lunch break.Cloud Peak from Mistymoon Lake.Dropping down to Paint Rock Creek.Small waterfall on Paint Rock Creek.One of several pika near our campsite.Sun setting on cloud peak above our camp.Stars starting to come out.Hitting the trial in the morning.Heading up through the talus.Summit of Cloud Peak coming in to view.Crossing "the narrows".Lots of boulder hopping.Cloud Peak summit shot.Glacier Lake and the Cloud Peak Glacier from the summit.Peering over the cliff at the lake below.Descending from the summit.Almost back to camp.Climbing back up from Painted Rock Creek.Cloud Peak from Mistymoon Lake, during the hike out.Tired but enjoying the scenery on the way back.Almost back to the trailhead.